Amongst the new features Sonar x3 had added vst3, so I was excited to finally include the s70xs natively inside a project. I have the v1.6 editor which works well in standalone mode, however when launched as a vst3 inside of sonar there is zero communication between the editor and the synth..
all 5 of the s70xs midi ports are enabled both input and output in preferences. can anyone confirm if they have the vst3 running in sonar x3 or alternatively confirm this bug?.. This warning is pretty clear. When you see an Exclamation mark in front of the Port assignment, it means the S70 XS is not being recognized by your computer program. We have never seen VST3 setup in Sonar so you will be the test. We can help you get setup on the S70 XS side. Can you describe how you are launching the “Yamaha S90 XS/S70 XS Editor VST” inside of Sonar. Launching it as a standalone is easy, but in order to use it within the Sonar environment, obviously there is a Sonar protocol for launching VST’s ... This we’ve never seen… Are you confident in that procedure? If so, the error message you are getting is a simple USB-MIDI communication problem. The “host app” being referenced is Sonar. So the error is within the Sonar side of the USB setup. For example, there are five ports of MIDI data streaming from the S70 XS - the host app will direct each stream of data to the right place. So look for a setup within Sonar for VST communication with USB. This is excellent news, it means you have the proper YAMAHA USB-MIDI driver and a working USB connection between the S70 XS and your computer. So we can eliminate all such issues that concern driver, cabling, etc. Let us know, if this is what you see. Port 5 is reserved for the S90 XS/S70XS REMOTE EDITOR which let’s you setup the keyboard to control other VSTi’s you may want to run in your DAW. it comes with 50 Template locations per bank… Many if the most popular VSTi have a built-in templates, and you can construct custom control templates for all of your VST synths and store them for instant recall. Let us know… Thanks. We are as excited as you about getting this configured. Once the MIDI is configured, we need to tackle setting up the audio Returns. Thank you for your very detailed response, and i appreciate your enthusiasm in helping to get this going! I have instantiated the VST editor with the following options ticked. 4. “Enable Midi Output” : Initially disabled (baby steps..) I would normally have this enabled, for example on the Virus or Fantom, to have incoming midi ports for access to any played arps or rhythm patterns. Port 1 MIDI Out : reads “Not Assigned”, and there is no pull down menu for selecting “S70 XS-1”..
Noel Borthwick, CTO of Cakewalk has been actively looking at this from their end, however has received a note from Steinberg that states “The reason this fails is because the Editor makes use of some private interfaces to look up MIDI and audio ports”.....? “Private interface”??? I don’t know what that means. When you say “all connected USB MIDI Ports are available” does this include all five of the S90XS/S70XS ports? Okay, if PORT-4 is connected the Editor will respond and change because it has bi-directional communication established. What the significance of the no MIDI IN option is because MIDI coming from your S70 XS arrives at the SONAR MIDI Track that is assigned to receive MIDI data from the S70 XS. So you mention a MIDI track - you need one dedicated to receive MIDI from the S70 XS… now its MIDI OUT, that is, the MIDI OUT of that track must be routed to the PORT -1 location (the one we are troubleshooting - that currently reads “Not Assigned” and has no drop down) - this is where the MIDI data routed from the S70 XS that arrives at the Sonar Track dedicated to this VST would receive the echoed data from the track… (We must find this port)!!!! So when you have this MIDI track for the S70 XS what do the MIDI IN assignment and the MIDI OUT assignment look like in Sonar? _ the Sonar MIDI track receives the MIDI Data and is set to “echo” the data to the S70 XS VST MIDI IN which triggers the S70 XS tone engine (there is no MIDI IN setting in the S70 XS VST Editor because it is “hardwired” when you assign your Track to the “S70 XS VST” MIDI IN… the MIDI OUT (the one that is NOT ASSIGNED) is responsible for returning (echoing) the signal to the hardware S70 XS tone engine. A VST that is internal to your computer has a similar routing only the signal does not travel via USB to arrive at the synths engine. So the S70 XS VST is an EXTERNAL VST. This will be important for them to understand. Let us know. That should help. There is no “private interface” that I’m aware of.... that is a strange comment. Sounds like miscommunication of some sort in the human communication element. Yes, the entire list of connected USB ports, including all five of the s70xs ports. reasons for no MIDI IN port.. understood. This seems to be the crux of the issue, s70xs port 1 is definitely connected. eg.. without the editor and with local control off i can play the synth from the s70xs or indeed from any other controller. IN the editor, USB Port 1 MIDI Out shows “not assigned” and there are no USB MIDI port options in the dropdown menu .. its a blank box. The midi track assignments look correct in Sonar..
a) the default midi input is “midi Omni”, and i can choose s70xs-1 or any of my other controllers (fantom, Virus). The midi track shows midi activity so data is getting to here. b) input echo is turned “on” ie this data is being sent to the track midi out. And this is the point where we are stuck..It is not possible to select an output USB MIDI port for VST Editor port 1. It came as a strange comment to me also.. but i do not know enough to understand just how standard the vst3 standard is, or what the implications of the comment are (other than “uh-oh"). I put an update about the ports from your last post into this thread at cakewalk, as there are other users with the same issue (scroll to the bottom for Noel’s comments).. Sorry, I don’t have Sonar so I cannot really take a look at this first hand, but the issue is selecting the MIDI OUT within the Editor VST. The fact that all works standalone, we have eliminated any foul play from physical connections, etc. We are down to Sonar having grabbed the port’s availability. I only know the routing in Steinberg - but signal flow will be the same in any DAW. When you setup to use a VSTi in Cubase you do so by initiating the VST INSTRUMENT setup - the fact that the S70 XS VST is external hardware is only a matter of routing. The significance of initiating a VST INSTRUMENT setup is to create the MIDI routing from the available controller sources, and the OUTPUT - it is where that OUTPUT goes that is the crux of the matter. What are the other options for the track’s MIDI OUT setting? Where does the audio returning from the S70 XS get routed? Where does the audio of other VSTi get routed? If it is a case of purchasing a copy of Sonar x3 I will fund that if it helps get this working.. there are plenty of users other than myself who would benefit..
and the second, shows that for port 1 the usb ports are not available.. Agreed, there is a difference between standalone where the editor manages directly the ports, and as a VST3, where the editor and the DAW must cooperate ..So what concerns me at this point is a few things.. These items do point to the editor being somewhat locked into Cubase, and while of course it is natural for Yamaha to promote sales of Cubase through tutorials, easier integration, better help etc, it would be very very worrysome that musicians choice to use other DAWs are being penalised :(. Would you be able to contact Steinberg to verify their comments?.. ie to see if the editor was written solely for Cubase?. If there was simply a misunderstanding of modes of communication as you initially suspected would you be able to encourage/facilitate a discussion between the VST editor engineers and Cakewalk to help get this resolved. Of course, feel free to contact Noel Borthwick of Cakewalk directly.. They are eager to resolve this.. Without the port 1 midi out connection the editor cannot sync with the S70xs and so there is no communication whatsoever… cannot change voices, move from voice>mutli etc, nothing. ..So what concerns me at this point is a few things.. Sorry I cannot participate in any paranoia or conspiracy theories, very disappointed that you immediately open that jar of worms. Really, you think that. Wow!?! I’ll help you anyway.... but, frankly I have no time for such nonsense. So if you don’t go there I promise I won’t either. Thanks for the offer to pay for a copy, but no thanks. That should not be necessary. I’m just interested that VST3 is implemented properly… And that you can use the Editor VST. From your screen shots, and I don’t know what this means, but the screenshot shows the Editor setup page of the standalone version! not the VST version. I’m not totally sure why, but it is why I asked about how you launch the editor inside of Sonar. On the editor go to HELP > ABOUT see if the editor reports it is the VST or just the standalone. I meant no disrespect from my comments, they were simply observations about what I have found and been told over the last several days trying to get things going.. So, if you took offense then I sincerely apologise..I certainly trust that this is not the case as the S70xs is one of my two favourite synths (other being the Virus) and so I really wish to get this working fully to its potential. All of the discussion in this thread, and the associated screenshots were taken with the VST editor as launched from within Sonar.. it is identified by the Sonar plug-in manager, and pulls up like other instrument editors (Virus Ti & Fantom G), or VSTi. Again, in standalone it (Editor) works fine.. as a VST Editor it cannot sync and will not communicate with the S70XS at all.. Sorry in doing our research we need to know exactly which version of Sonar X3 are you using - we have been looking and see three different version of the program… and do they all feature the same level of VST3 compatibility and routing capability? Interesting. A screenshot would be very helpful, sorry, but it would. Thanks. See below the layout of the SETUP window when run as a VST - notice the difference between yours and this (PORT 1 “MIDI IN” option is not available). The PORT 1 “MIDI In” option only appears when the Editor is run as standalone (as far as I know). I will assemble all the information I can and see what the word is so let us know and your screenshots will help. Thanks. Also under FILE > VSTi SETUP... that screenshot, as well, would be helpful. And if you do not see “VSTi SETUP” as an option, then a screenshot of the FILE pulldown list of options. Thank you, again. Sonar comes in three versions base, studio and producer. The differences are the availability of the prochannel(strip) and the amount of included bundled software. There is no differences in routing or VST3 compatibility. I certainly see the difference you refer to in the setup screen..in your posted case the port 1 midi in is “lined out” whereas in my case its a blank box. I note that the Editor main screen does NOT show File>VSTi Setup but File> Setup, as shown here..
but, the help>about does indeed show S90XS / S70 XS Editor VST Ver 1.6.0 as shown here..
Yeah, this is strange and I will have to let the engineers figure this out… Clearly it says you are running the VST version, yet every thing else says it is the standalone version, including the fact that it does NOT work inside Sonar. Would not be the first time things are implemented wrong. We’ll have to wait and see. The “VSTi Setup” option that is also missing from your VST version allows you to select the returning audio driver to which you have the S70 XS connected, totally necessary to hear (monitor) the audio return from the S70 XS. The fact that I don’t know what or how the folks at Sonar implemented this is not what scares me, it’s that the key components are missing that would allow an external VSTi routing to work. How does Sonar setup to return audio from an external VSTi? I think the connectivity of an external synth is largely based upon the abilities of the Editor.. Sonar in every instance will create a stereo return track for an instantiated VST Editor or VSTi for an external synth. a) The Fantom G has an editor that focus’s solely on setup and control of the Fantom, and so, while the instantiated track folder for the VST Editor contains a midi source track and a stereo return track, they both must be manually assigned by the user. The stereo return track to the audio input source where the FG analog outputs are connected, and similarly the midi source track must be targeted to the Fantom G usb midi port. (this Editor does not pass keyboard data so does not “grab” the FG port). b) When the external synth is a full VSTi such as the Access Virus TI, (where the USB can carry up to three stereo pairs of audio data) the audio tracks are automatically placed into the VSTi synth track folder and are pre-assigned. So the track folder includes a source midi track and the associated audio tracks. c) In the case of the S70xs, there is no audio track instantiated as part of the VST. Now, to be honest i did not notice at first as iirc the s70xs does not carry USB audio so it was no big deal to create an audio track, source it from the correct analog inputs and place it into the track folder.. however I now I suspect the lack of an audio track in the VST Editor track folder is an artifact of the mixed up standalone/VST problem we are having. Incidently i have a Motu 828 mk III hybrid, with Virus Ti, S70xs, Fantom G and Nova connected to the 4 pairs of analog inputs...all available directly within the DAW. The Motif XF VST editor is similar - however it has full control of the Motif - I can change voices and settings. The Midi In selection item DOES display when in vst mode from inside Sonar (X3b PC 64bit)- but it is blank and not selectable - but WORKS, the default midi in works fine, it is only the midi out (which would be to main or midi 1 (?) ) which is not selectable. The port for the remote control seems to auto connect and work fine. All I had to do was select firewire on initial install. It then synced itself with the Motif and all controls worked, voice selection and parameter editing. The one thing that DOESN’T work, is I can’t play back through the Motif. I can play the Motif keyboard and see the keys react in the VST editor and even record them, but they do not echo back to the Motif to generate sound. So with the Motif XF VST, only the key midi out is not functional - there is no list to select from and just says ‘not assigned’. Excellent, you are having more success than the OP. I wonder if the fact that FW also includes the audio is why you are having some success where the S70 XS user is having none. 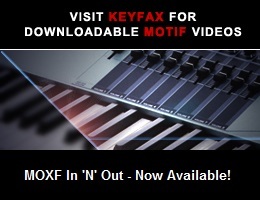 When you say you cannot “play back through the Motif” we assume you have the XF set as your audio interface? The S70XS editor still appears as the standalone/VST hybrid discussed above, with the identical “not assigned” for port 1 midi out in the Editor setup window. In the case of Studio One the S70XS-4 USB VST comm port is working and the Editor can control the S70XS.. voices can be changed and mode altered between Voice > Multi, etc. As this was different to Sonar, I went back to x3 and repeated my tests.. When I de-selected the S70XS-4 port from the preferences in Sonar MIDI settings, I can now confirm that the VST3 Editor is controlling the setups voices and parameters within the S70XS. I suspect that Sonar was grabbing that port and not releasing to the VSTi, but this part now works ok. In Studio One, although keystrokes are seen on the virtual keyboard of the VST Editor when played by the S70xs (or any other keyboard controller), there is no sound coming from the audio outs of the S70XS.. this seems to mirror what is seen by user grnbriar above. In Sonar, the case still exists that there is no keystrokes visible on the virtual keyboard and no sound is coming from the S70XS.